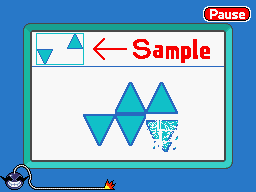 Breaking Up is one of Orbulon's microgames in WarioWare: D.I.Y. and WarioWare Gold. It is a pun on a couple when they "break up" in a relationship, ending it. 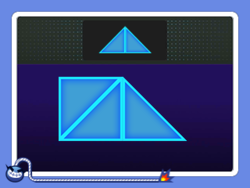 To win the game, the player needs to break a certain amount of triangles to match the picture in the top left corner. If the player gets it right, they win. If they make a mistake or time runs out, the game ends in a loss. In WarioWare Gold, the time limit is doubled. This page was last edited on March 11, 2019, at 17:32.